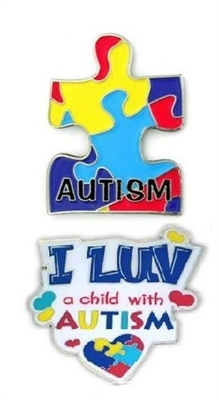 The puzzle lapel pin is made of solid brass and plated in silver. It is 1" tall has the symbolic color puzzle pattern and enamel colours. The Luv a Child with Autism pin is 1-1/8" tall. It is die struck from solid brass, nickel plated, and coated with a protective epoxy varnish.